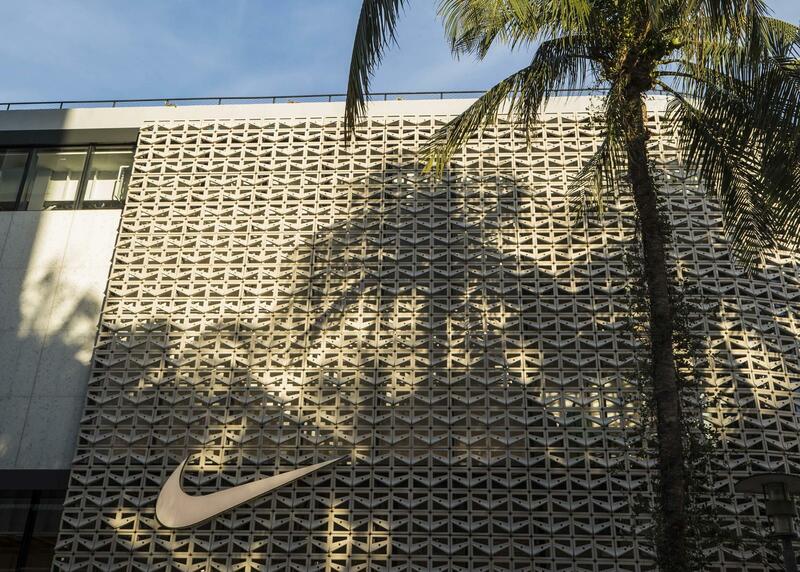 MIAMI BEACH, Fla.–(Business Wire)–NIKE, Inc. (NYSE:NKE) will open Nike Miami, its newest retail experience tomorrow, Thurs., Jan. 19. The two-story, multi-sport store is digitally connected across more than 31,000 sq. ft., and is located at 1035 Lincoln Rd., in the heart of the City of Miami Beach’s shopping district. The new Nike Miami is designed to deliver the best of Nike products and personalized services through a series of unique spaces. Guided by a team of highly trained Nike store athletes, Nike Miami offers personalized, immersive experiences for consumers. Nike Miami’s unique spaces are the ultimate service destinations and include: an interactive digital Nike+ Running Trial Zone; immersive Nike+ Soccer and Nike+ Basketball Trial Zones, where consumers can try out the Brand’s latest products; The Lounge, a women’s boutique within the store featuring a treadmill, greatly expanded and enhanced fitting rooms and personal styling service; the Nike+ Service Station, a dedicated service space to consult with Nike certified store experts; and The Stands, an in-store space where consumers can connect with one another and experience live in-store programming, including Nike+ Member Sessions. Nike Miami offers some of the hottest exclusive products, as well as re-stocks, including the recently released HyperAdapt 1.0, currently offered by appointment only, exclusively at Nike Miami. The store will also feature Nike’s latest premium products, including Kobe Fade to Black Pack, Kyrie 3 “What The,” Air Force 1 Ultraforce Mid, Zonal Strength Tights and the Apple Watch Nike+. The store design is inspired by the lifestyle of modern sport and features a unique installation from Miami artist Jessy Nite. The artwork—a multimedia combination of painting, custom typography and sculpture—takes inspiration from the vibrant colors of Miami and the power of sport. The exterior of the building showcases a brise-soleil, a common architectural feature in South America and South Florida used to mitigate the warm afternoon sun. The pattern of the brise-soleil is comprised of two Nike icons: the waffle iron and the Windrunner. For members with Nike+, Nike Miami unlocks premium services and benefits that streamline and enhance the shopping and membership experience, including the ability to book a 1:1 appointment with an expert, invitations to events and sessions, easy receipt-free returns via their Nike+ profile, 30-day product trials all made available via being a member with Nike+ and having the Nike+ app. Nike Miami also offers seamless commerce—allowing consumers to buy products in store and online from Nike.com in a single transaction from the store, with free delivery of the online product. The store provides scheduled courier delivery of in-store purchases to certain Miami addresses, including hotels. 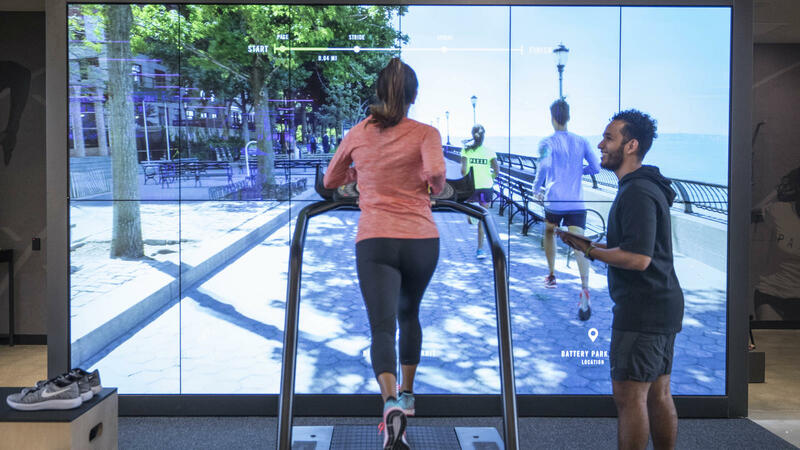 Three immersive Nike+ Trial Zones transport consumers into authentic sport moments, bringing true sport experiences into a personal shopping destination. In the Nike+ Running Trial Zone on the first floor, consumers start by consulting with Nike certified running athletes on the best choices for footwear. They can then test out shoes on a treadmill surrounded by two cameras capturing data from their run and a video screen that records them on a 90-second real-life run. Consumers’ personal trial experiences may be saved to their Nike+ member profile, to enhance future shopping experiences. 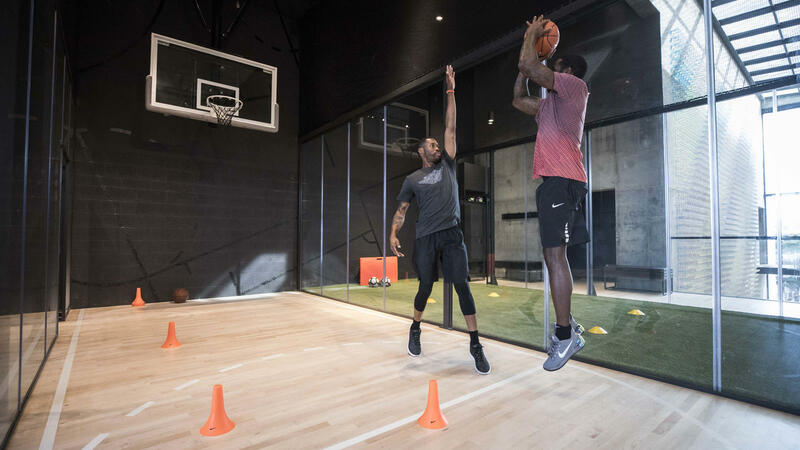 The Nike+ Basketball Trial Zone, located on the second floor, simulates the feel of the game in a 285-square foot space. Consumers consult with Nike certified basketball experts to select the best choices for footwear and receive 1:1 guidance on product features and benefits. They can then test the shoes in an enclosed basketball trial zone, allowing for the simulation of an actual game or practice environment. 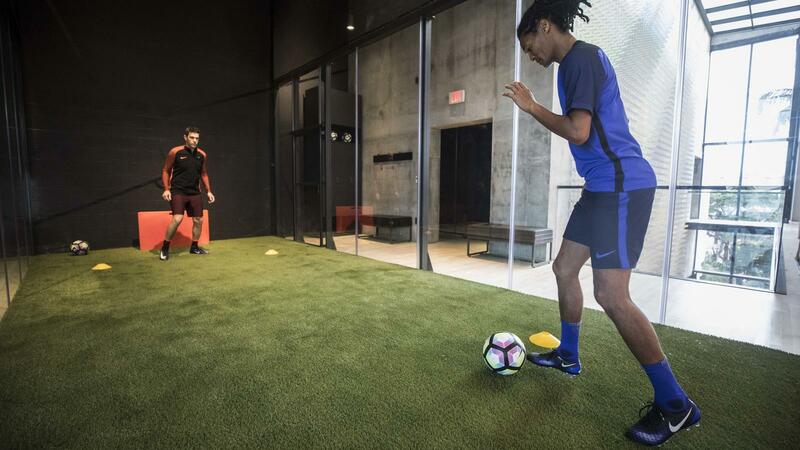 The Nike+ Soccer Trial Zone, also on the second floor and adjacent to the Nike+ Basketball Trial Zone, is a 285-square foot cleat trial area, encased in glass walls, with a synthetic turf field and supported by Nike certified trial athletes. Consumers can trial Nike’s best soccer cleats and receive 1:1 guidance on product features and benefits. At Nike Miami, experts are at your service. The Nike+ Service Station is home to the Nike+ 1:1 service, a private appointment with an expert who provides Nike+ members with a product gear-up, immersion in the Nike+ ecosystem, a curated takeaway and access to Nike services and events. The Stands is the store’s first service destination, offering a special seating area for live in-store programming, including Nike+ Sessions—intimate discussions with leading athletes, trainers, and trendsetters. With a large boutique space, Nike Miami’s Lounge is designed to transform sport retail for women. 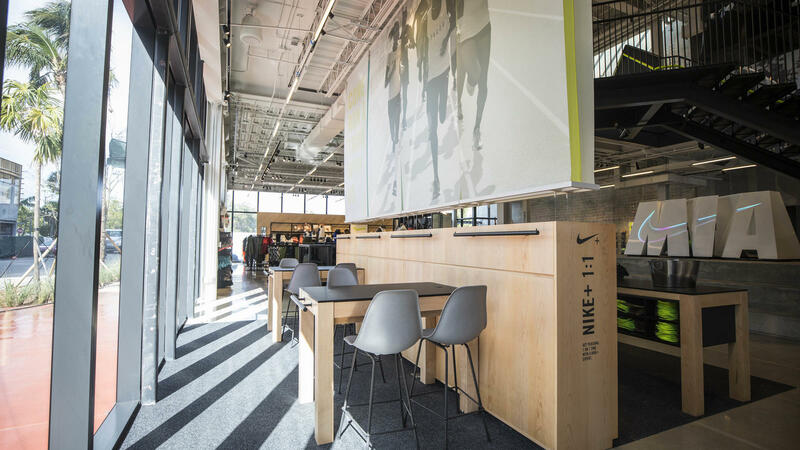 Guided by Nike certified store athletes, consumers can test out products on a treadmill and in enhanced fitting rooms that are double the size of a standard Nike fitting room. The Lounge offers an array of services, from Nike+ 1:1 personal appointments to bra fitting, pant hemming, and digital checkout. There are three adaptive lighting changes in all fitting rooms in Nike Miami—replicating the feel of yoga studio to a night run. Nike+ Member Sessions, located in The Stands, provide members with Nike programming, featuring Nike+ Run Club and Nike+ Training Club events, and Nike+ Speaker Sessions, an opportunity for consumers to engage with local nutritionists and trainers. Nike Miami is open seven days a week. Store Hours: Monday-Saturday, 10 am to 11 p.m. Sunday, 11 a.m. to 10 p.m.
Marshall’s? 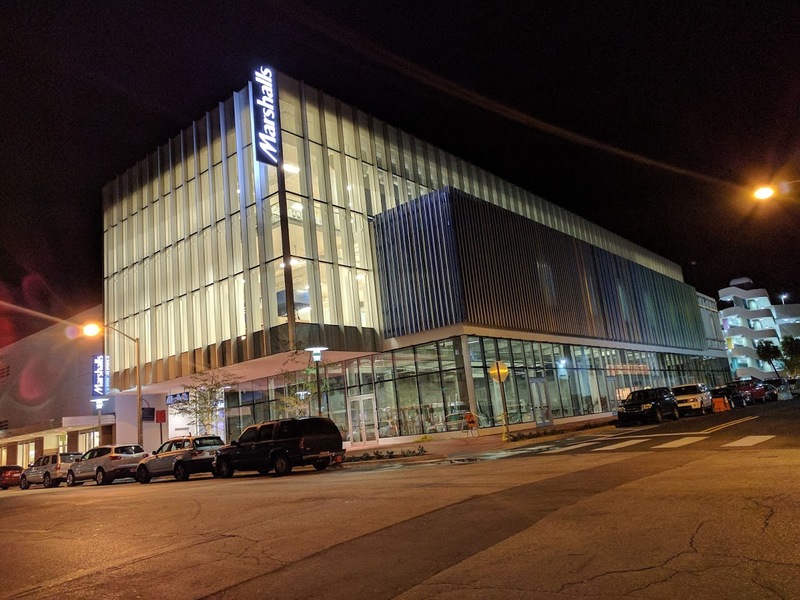 it’s a nice building but…Marshall’s? 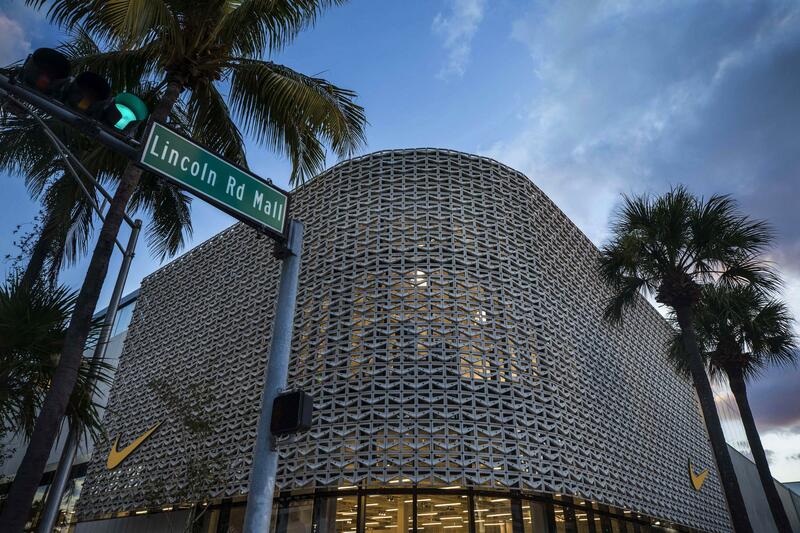 Remember when Lincoln Road Mall was not a “Mall” and was full with small cozy stores, bars, decent restaurants (no turistas traps) jazz places, gay bars, book stores, the restaurant in the iconic building with a bar on the second floor that now is a souless aseptic store? THE griddines of the landlords killed that and turn this place in another sawgrass mall with tourists that can’t afford what’s on sale!! RIP Lincoln Road. It was nice while it lasted. can almost guarantee in 4 years there will be huge amount of storefronts vacant….. I think this in Nike’s 10th attempt to open such a big store in Miamis market. Consumers are buying mostly online nowadays, I dont see the need for so many SF to sell shoes! !